Innovative indoor climate solutions experts, Zehnder Group UK, is proudly unveiling its ground-breaking, multi-service ‘Foil’ product, which encapsulates heating and cooling, lighting and other functions all in one product. The Foil has been jointly engineered with lighting specialists Whitecroft, and will be targeted at schools, educational facilities and commercial buildings. The Foil’s integrated design is unlike any other solution on the market, due to the number of functions it houses in one panel. Bringing together Zehnder’s expert knowledge in radiant heating and cooling, and Whitecroft’s heritage in specialist lighting, the Foil combines all the best features of energy efficient heating and cooling, acoustics and lighting. Other services such as speakers, fire alarms, sprinklers and smoke detectors can also be easily incorporated into the design. The product also boasts a double activation feature that ensures heating and cooling performance is maximised. The panel contains perforation on both sides, meaning sound absorption is optimised and acoustic performance is considered , which is of prime importance in learning environments. The panel is customisable and easy to install, with plug and play connections and simple maintenance requirements. 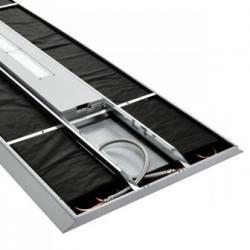 Developed with the installer in mind, the Foil offers simple and easy cable management, lighting module integration and easy hydraulic connection. The panels have a sleek, smooth aesthetic, creating an appealing ambience due to its clever utilisation of space. The fact that all functions are housed in the one panel means that ceilings can remain uncluttered, contributing to a sustainable and inspirational learning space in schools and other educational settings. In addition to their pleasing appearance, the panels also meet all necessary requirements, including energy standards and acoustic design standards for schools. Tested to EN 14307, EN1264 and ISO354 standards, the Foil has a maximum working temperature of 80°C, a maximum test pressure of 7.8 bar and a maximum working pressure of 6 bar. For more information, visit Zehnder Multi-Service Foil page on the Zehnder Group UK website. Zehnder Group UK Ltd offers a world of Indoor Climate Solutions for residential, commercial and industrial applications including heating, cooling, ventilation and clean air products. Comfort, Health and Energy Efficiency are core to the business operations through product design and development to technical advice and service. We spend 70% of our time within four walls - the need for comfort is crucial to our well-being. Zehnder Group UK uses comfort as the leading objective when designing indoor climate solutions for homes, offices, schools and more.